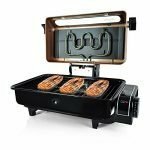 The indoor electric grill niche is growing quickly with a wide variety of manufacturers rushing to offer up their wares. 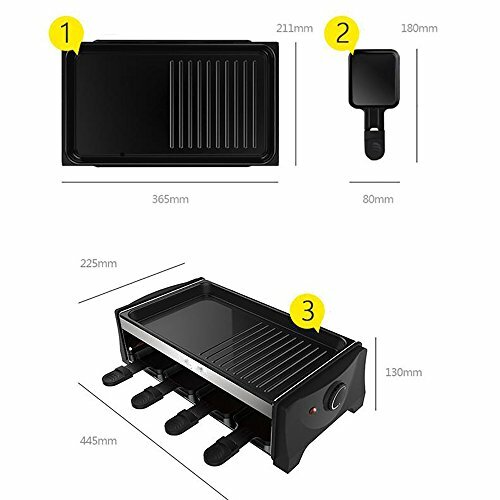 The Barbecue Frying Pan company’s B07D1MHXQZ Infrared Electric Grill is internationally developed and shipped. As such it is set up to handle some specific Asian grilled dishes. This unit takes a spin with the concept of individual cooking and service dishes that you find in things like Korean barbecue or Japanese Yakitori. The idea is that two people can sit at the grill to prepare individual pieces of meat, fish or vegetable. If one element gets done before another, it can be placed in one of the four small warmer plates at the base. If you prefer you could also keep side dishes like single servings of rice in the lower compartment as well. The base also has non-skid feet to make it more stable, and prevent it from being bumped by the occasional clumsy elbow. It has a large electric element that consumes 1300 Watts of electricity. This gives the grill enough heat to nicely sear off meat and vegetables. The main cooking hot plate has some ridges in it to keep the meat from sticking flat to the bottom. This also makes for easy flipping with a fork, salad tongs or pair of chopsticks. This is meant to be an economy item, so you shouldn’t be prepared to be overwhelmed by high-end quality. Still, it is capable of getting the job done. Just take care when you clean it, so as not to scrape the non-stick surface. There is very little in the way of assembly. You simply need to put everything in its proper place. 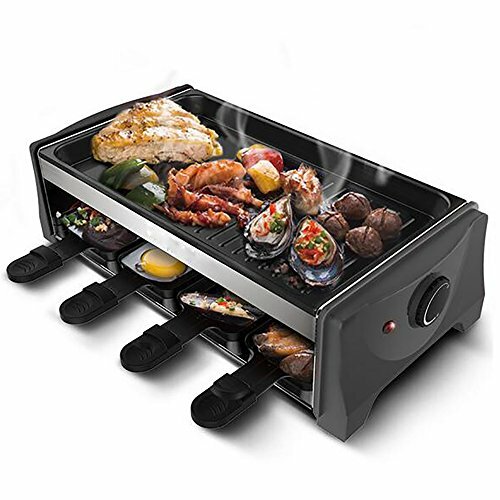 This electric grill has not been tested by the UL or CSA, so double check with your apartment manager to make sure this grill is in compliance with any of their indoor grilling rules. If you are looking for a way to sear up a T-bone steak on an indoor grill, this isn’t the unit for you. Its meant more for searing up small portions of food, while holding over dishes. Excess marinades can be an issue as the ridged area of the hot plate isn’t very deep. 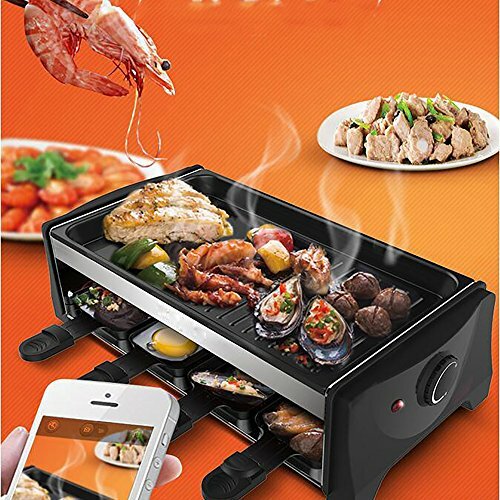 The manufacturer intended this electric grill to be the sort of thing where two people sit down and cook together face to face. It isn’t necessarily meant to cook for a large group of people. It also isn’t meant for slow cooking or handling thick cuts of meat. A bone-in chicken breast is going to burn on the outside long before the interior meat by the bone is done. Once we set aside what it’s not meant for, you can get down to the business of searing up some flavorful pieces of meat. While it certainly was built for Asian meals, like searing off strips of pork, beef, chicken, and vegetables, it isn’t limited to only those foods. Indeed, you could make a nice little batch of fajitas with this grill. If you happen to be living in a dorm that allows for a hot plate or an indoor electric grill, you could even make a nice batch of hot dogs with crispy skin. 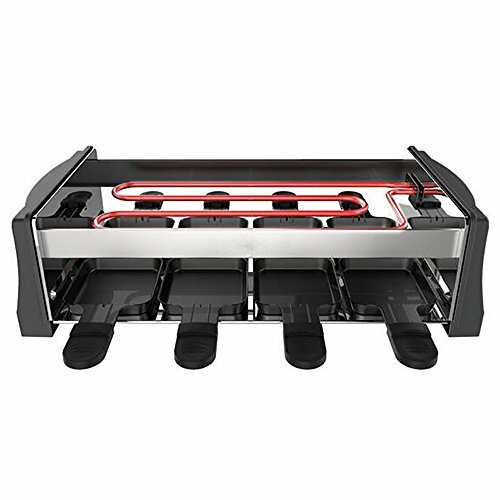 The lower section of the base has four small hot plates to either hold overcooked food as a warmer or to keep sides and other additions. The adjustable thermostat heat controls have a wide range. While it can dial down to lower temperatures, this is still meant to be for searing foods and cooking items that don’t have a bone inside them. 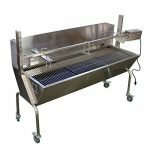 This unit is a little more work to clean than you find with some other indoor electric grills. If you are cooking multiple loads of food that have excess marinade, it might become an issue in the middle of the cooking section. The drip tray underneath isn’t all that big and can potentially overflow if you are cooking something greasy or there is a lot of excess marinades. It can sometimes get a little hot. The manufacturer even states that you should put a little water in it, just in case it smokes a little bit. You also need to be careful when you clean it. Ideally, you want to handwash the main hot plate in warm soapy water, with a nonabrasive sponge. The warmer plates should also be hand-washed. While you could put these hot plates in the dishwasher, they are not specifically rated to be dishwasher safe. You can get away with it two, three or even five times, but the more you use the dishwasher the more the surface will start to lose its non-stick properties. This electric grill is not covered by a manufacturer’s warranty at this time. There are a lot of different takes on the modern-day indoor electric grill. This particular unit is designed to be inexpensive while letting you scratch the itch for a little Asian cooking flare. It is also right at home when you want to whip up some fajitas or some Mexican street tacos. So long as you keep these things in mind, and you take the time to clean it properly, this little electric grill will get the job done. Just don’t expect to be blown away by high quality unit. Non-stick surface means very little oil needs to be used. 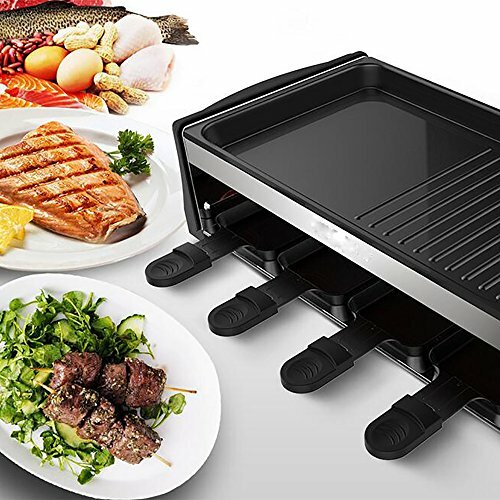 The ribbed surface with holes and oil drip tray keep the food free of fat and grease, meaning food cooked on the grill is healthier and retains its natural flavour. 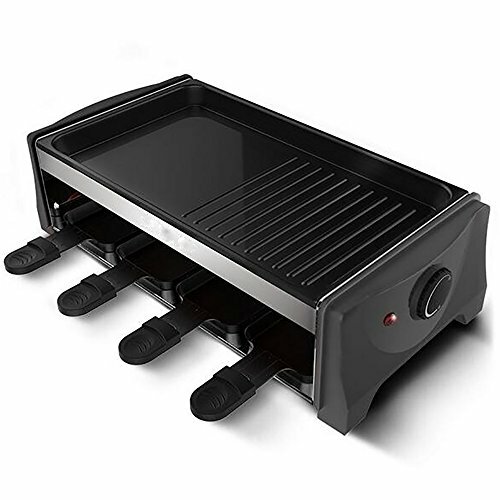 There are two handles each side for convenient moving,besides,the feet are designed to be non-slip, which can keep the grill in stable and prevent from your cooking platform from damage. Ideal for dinner parties, individual meals, barbecue-style food, stir frys. Portable grill is great for travelling, especially for camping and caravanning holidays. It is easy to carry and move anywhere you need it. Featuring a separate heater and grill plate, the ribbed design of the cooking surface ensures complete heat coverage of the grill plate and lets you achieve the best results. Special channel design at bottom side of die-cast aluminum grill plate. Protects the heater better and extend service time. 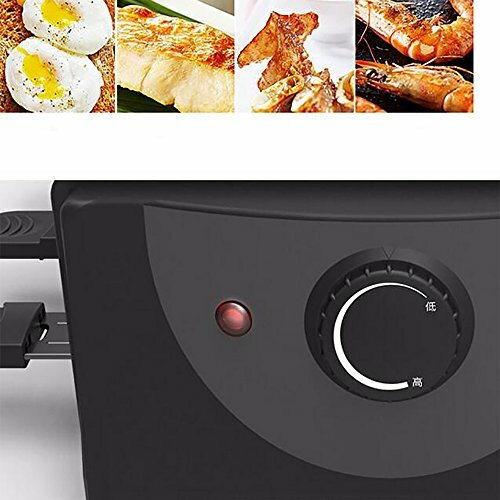 Features an adjustable temperature control, which can be adjusted to your desired temperature for different food.